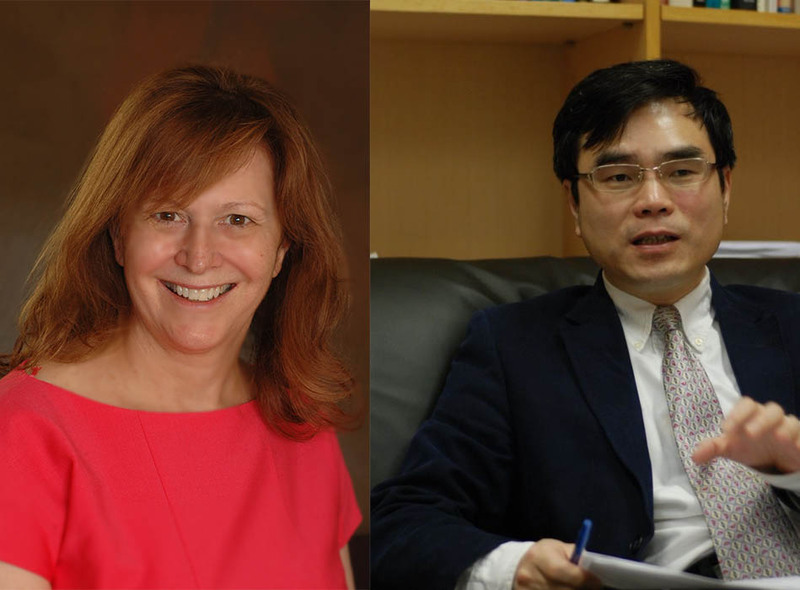 Autism researcher Margaret Clarke and renowned economist Junsen Zhang will be presented with Distinguished Alumni Awards at this year’s Fall Convocation Ceremonies. The award recognizes McMaster graduates who have attained a high level of distinction and achievement through scholarship, research, teaching, creative contributions to the arts or sciences and/or service to society. Clarke is a professor in the faculty of Medicine and a fellow of the School of Public Policy at the University of Calgary. Known for her work related to autism, Clarke is the founding executive director of The Ability Hub and the Sinneave Family Foundation. She has also served on the National Expert Advisory Committee for the Centres of Excellence for Children’s Well-Being and on the board of the Alberta Centre for Child, Family and Community Research. She chaired Alberta’s Expert Advisory Panel on Autism and is a member of the Telus Community Board and the Canadian Autism Partnership working group. She devotes significant clinical time to the Elbow River Healing Lodge. A two-time University of Calgary Gold Star Teacher, Clarke was named to Alberta’s list of top 100 physicians of the century. Zhang is a two-time McMaster graduate who is the Wei Lun Professor of Economics and the chair of the Department of Economics at the Chinese University of Hong Kong. He is also co-director of the Institute of Economics and Finance. Much of Zhang’s research has focused on widely applicable family-related issues including marriage, education, intergenerational transfers and gender bias, along with macro issues such as aging and economic growth. Zhang has served as editor of the Journal of Population Economics since 2001 and is a former president of the Hong Kong Economic Association. He also contributes to broader-interest publications including Ming Pao Daily and The Wall Street Journal. A fellow of the Econometric Society, Zhang has twice been ranked as one of the world’s Top 1,000 Economists. He is a member of the McMaster Alumni Gallery. Clarke and Zhang will be presented with the awards on Nov. 17 and 18. Autism researcher Margaret Clarke and renowned economist Junsen Zhang will be presented with <a href="https://alumni.os.mcmaster.ca/s/1439/index.aspx?sid=1439&amp;gid=1&amp;pgid=397">Distinguished Alumni Awards</a> at this year's Fall Convocation Ceremonies. The award recognizes McMaster graduates who have attained a high level of distinction and achievement through scholarship, research, teaching, creative contributions to the arts or sciences and/or service to society. Clarke is a professor in the faculty of Medicine and a fellow of the School of Public Policy at the University of Calgary. Known for her work related to autism, Clarke is the founding executive director of The Ability Hub and the Sinneave Family Foundation. She has also served on the National Expert Advisory Committee for the Centres of Excellence for Children’s Well-Being and on the board of the Alberta Centre for Child, Family and Community Research. She chaired Alberta’s Expert Advisory Panel on Autism and is a member of the Telus Community Board and the Canadian Autism Partnership working group. She devotes significant clinical time to the Elbow River Healing Lodge. A two-time University of Calgary Gold Star Teacher, Clarke was named to Alberta’s list of top 100 physicians of the century. Zhang is a two-time McMaster graduate who is the Wei Lun Professor of Economics and the chair of the Department of Economics at the Chinese University of Hong Kong. He is also co-director of the Institute of Economics and Finance. Much of Zhang’s research has focused on widely applicable family-related issues including marriage, education, intergenerational transfers and gender bias, along with macro issues such as aging and economic growth. Zhang has served as editor of the <em>Journal of Population Economics</em> since 2001 and is a former president of the Hong Kong Economic Association. He also contributes to broader-interest publications including <em>Ming Pao Daily</em> and <em>The Wall Street Journal</em>. A fellow of the Econometric Society, Zhang has twice been ranked as one of the world’s Top 1,000 Economists. He is a member of the McMaster Alumni Gallery. Clarke and Zhang will be presented with the awards on Nov. 17 and 18.